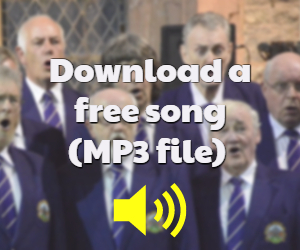 There’s nothing quite like the unique, authentic sound of a Welsh Male Voice Choir. Denbigh & District Male Voice Choir has been entertaining audiences across the UK, and internationally in Ireland and Germany, since 1988. We’ve taken part in the Triennial Festival of Massed Male Voice Choirs at the Royal Albert Hall , London, on four occasions. We’re no strangers to TV either, having featured in two series of “Gwahoddiad” on S4C during the 90’s, and numerous other TV appearances including ‘Dechrau Canu, Dechrau Canmol’. Live broadcasting and recording is something we greatly enjoy. You you can often hear us being played on request programmes on Radio Cymru.